Traditionally Halloween has been a big time for me performance-wise. I do the event at the Cathedral and the dog does the PUPkin. Maybe I do another Halloween thing with puppets. Then there's trick or treat night in my neighborhood and the marathon runs down one of our streets soon after. This year it's getting so I'm having to turn jobs down! I hate hard decisions. Tomorrow night I go to the Cathedral (shows at 7 & 10, you really should come) and probably put on a devil costume (but maybe I'll be something else, you never know) and scare people FOR MONEY. I love that they pay me to do this. It's awesome. It's a long night, though. I'm going to need a nap. Saturday I turned down a gig at the Brooklyn Botanical Gardens dressing as one of the Bremen Town Musicians in order to try very hard not to scare small children. I turned it down because I opted for prestige rather than pay. 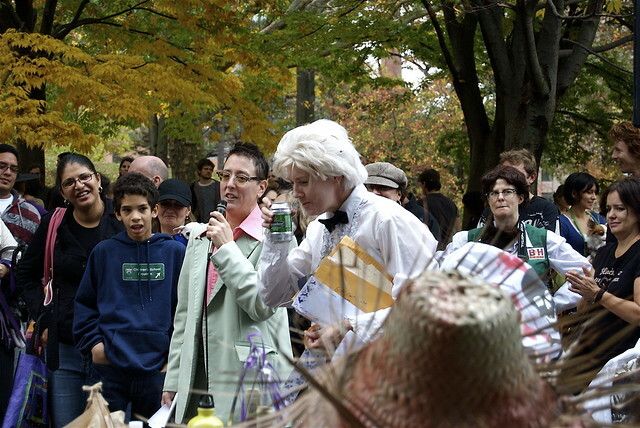 Nearly every year the PUPkin is hosted by Justine (pictured above in the mint green tux). Due to a family emergency she is unable to be with us on Saturday. Kath (pictured above in the wig, drinking the illegal beer) asked me to step in. Those are big shoes to fill but, honestly, I'm just keeping 'em warm for when Justine comes back next year and it's an honor to do so. I'm a little nervous, you guys. Here I thought I was just going to be trotting Ed across the stage in his finery (costume reveal tomorrow) and now I'm entertaining my biggest audience in years. Ok, you're right, I'm excited, too!